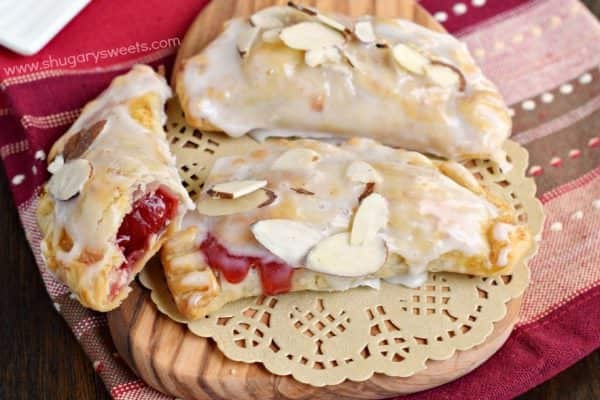 Easy, baked Cherry Almond Hand Pies! 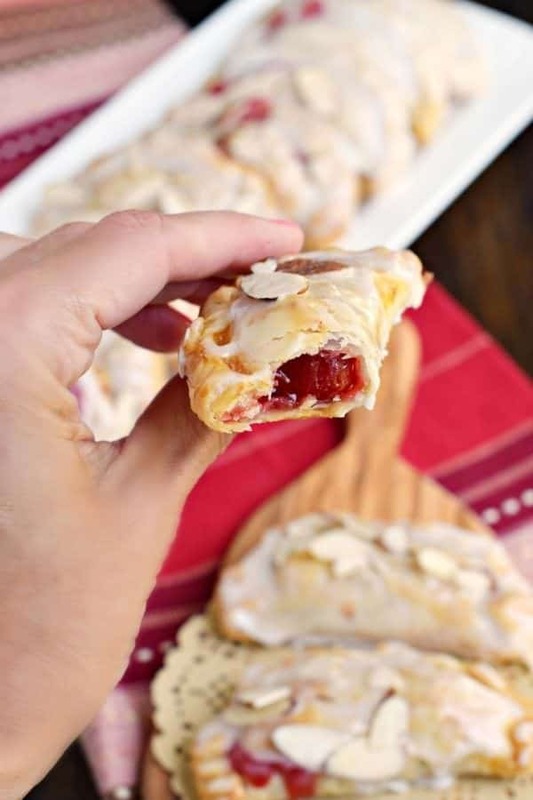 A flaky crust with a cherry almond pie filling, dipped in a sugary glaze and topped with sliced almonds. The perfect dessert! It’s that time of year again. When I spend hours a day glued to my television watching Le Tour de France. Yes. Bicycling. I know. You’re rolling your eyes. I get it. It’s not something that most 40 something housewives are glued to on their TV’s. I should be watching Real Housewives, or some other Bravo TV, right? And while I’m busy watching up to 6 hours of the tour every day (FOR THREE WEEKS, don’t judge)…my house is in shambles. We’re eating frozen pizza for dinner. And dessert? Ice cream. 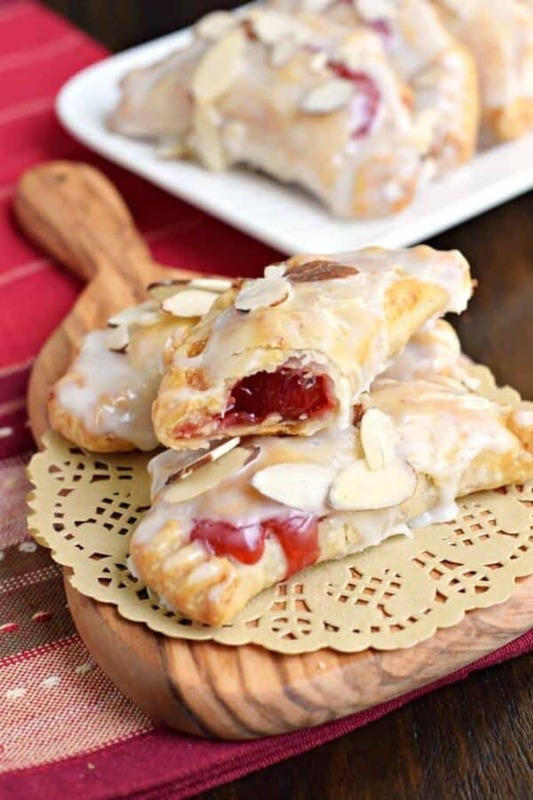 Unless of course I decide to whip up a batch of these SUPER EASY Cherry Almond Hand Pies. They are so easy I can make them while watching the tour. Ha! To give these hand pies a little boost in almond flavor, I stirred in some almond extract to the cherry pie filling. I could seriously add almond extract to all my baking. It just adds such a nice, nutty flavor without overwhelming this simple dessert. For presentation, I sprinkled on some sliced almonds after dipping these hand pies in a sweet, sugary glaze. Because these are baked and not fried, go ahead and indulge. ENJOY! 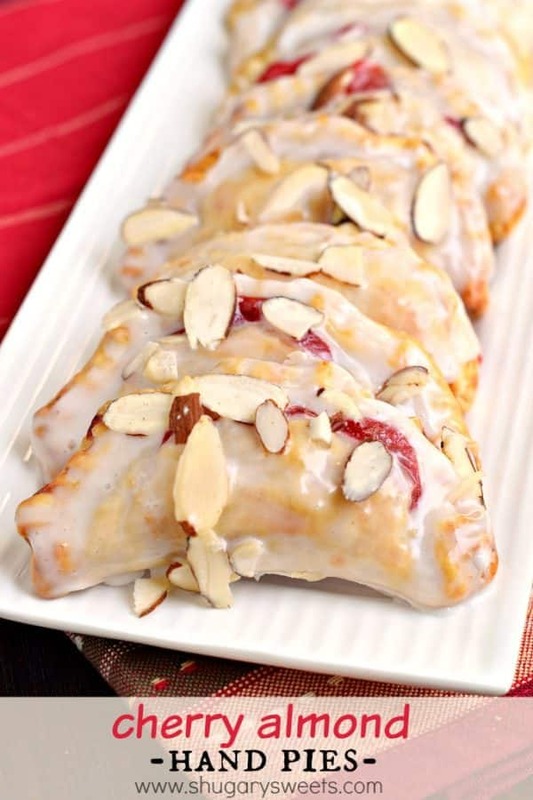 If you love today’s Cherry Almond Hand Pie…here are a few other recipes I think you may enjoy…. 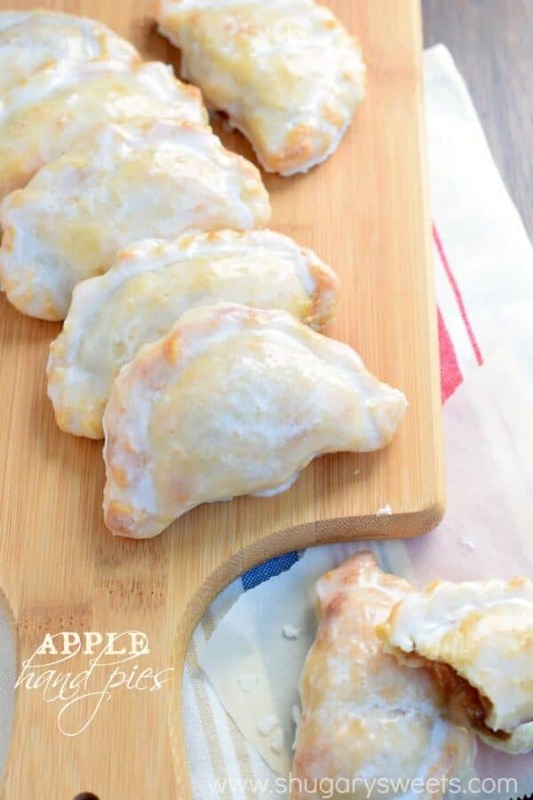 Apple Hand Pies: a homemade apple pie filling in these delicious, baked pies! 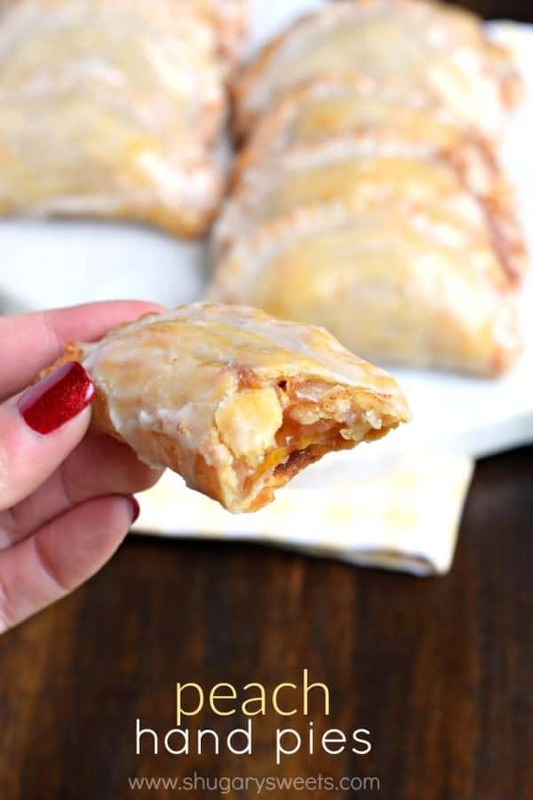 Peach Hand Pies: one of the most incredibly easy comfort food recipes! 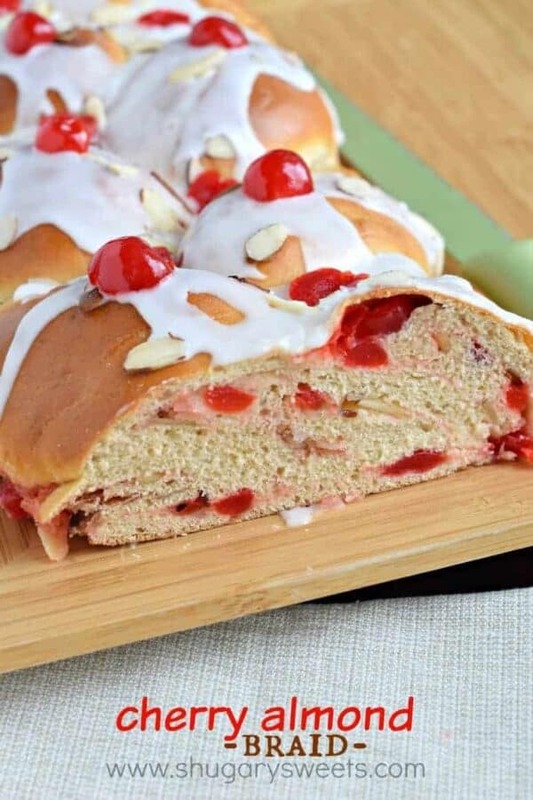 Cherry Almond Braid: take your breakfast to the next level with this delicious flavor combo! Gotta hand it to you for being able to watch all that biking. I get kind of bored and space out after a while. But I can watch beach volleyball forever, so can’t wait for the Olympics! These look incredible. Cherry and almond is the best combo! It makes me laugh every year when you talk about being glued to the tv watching people bike across the country. I’ve never known anyone else to do that! But give me a batch of these pies and I might be able to sit and watch…for at least an hour anyway! Love the cherry almond combo here!!! I could literally bathe in almond extract because it smells so amazing!! I love to make hand pies with the fruit we grow here on our 500-acre farm. These look delicious. I think I could literally eat the whole plate. I am going to call you the hand pie queen!! I could totally sit there and watch hours of the Tour with you, but can we eat these hand pies while we do?! 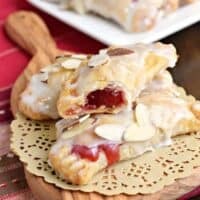 They remind me of the cherry turnovers that my grandma used to make for her pie shop, I just love any pastry stuffed with cherries and almond! These sound amazing. Am pinning to make at a later date. 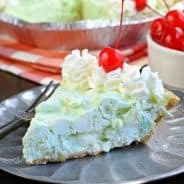 Will be putting cherry pie filing on the grocery list for this week. These look seriously delicious. Beautiful combo – cherries and almond. 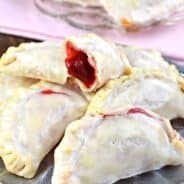 I recently made your peach hand pie recipe, which was SO tasty and SO quick to put together for an appreciated dessert to compliment our cookout. This will definitely be made in my kitchen soon. 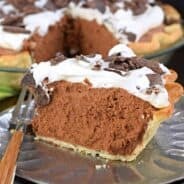 I really think the icing all over the pie really kicks these up a couple of notches. yummmm Thank you for sharing your recipes. I’m loving your blog! Can these be frozen? Are there other ways to store them for longer?